Dr. Darwin Deen is one of the nation’s foremost authorities on nutrition. Currently Professor of Clinical, Family and Social Medicine and Director of Medical Student Education at the Albert Einstein College of Medicine in New York, he has trained a generation of physicians on the connection between nutrition and health. He has played a leading role in revising medical school curricula to incorporate nutrition training. An award-winning teacher and noted author, he serves as Chair of the Task Force on Medical Nutrition Education of the American College of Nutrition and co-chairs the Group on Nutrition of the Society of Teachers of Family Medicine. His years of experience as a family physician make him perfectly suited to advise clinicians on counseling their patients on diet and lifestyle. Dr. Lisa Hark is a renowned family nutrition expert, with more than 20 years of experience in nutrition counseling and promoting the benefits of healthy eating in children and adults. As Director of the Nutrition Education Program at the University of Pennsylvania School of Medicine in Philadelphia, she developed a model medical school curriculum and textbook, Medical Nutrition and Disease, which has become one of the most widely used texts in nutrition education. She was given the Excellence in Medical/Dental Nutrition Education award from the American Society for Nutrition. Dr. Hark was also the host of the TV show, “Honey, We’re Killing the Kids,” which airs on TLC, and is a widely sought after speaker who communicates nutrition concepts effectively to health professionals, patients, and the media. Darwin Deen, MD, MS Professor of Clinical Family and Social Medicine, Department of Family and Social Medicine, Albert Einstein College of Medicine, New York. A board certified family physician, Dr Deen also holds a graduate degree in Human Nutrition and has been teaching nutrition for more than 25 years. He is the author of numerous papers in peer-reviewed journals and has served as a journal contributing editor and manuscript reviewer for family medicine and nutrition journals. Lisa Hark, PhD, RD Director, Nutrition Education and Prevention Program, University of Pennsylvania School of Medicine. She is the editor of the popular nutrition textbook, Medical Nutrition & Disease, 3rd edition. She has broad experience in teaching nutrition to physicians and medical students and is a nationally known medical nutrition educator. Section 1 Nutrition as preventive medicine. 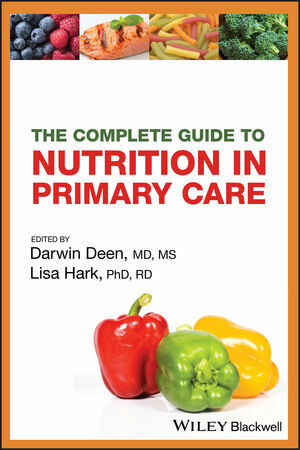 1 Nutrition and the primary care clinician: Darwin Deen (Albert Einstein College of Medicine) and Katherine Margo. 2 Changing the office culture to make it work: Arlo Kahn and Jane White. 3 Methods of weight control: Cathy Nonas and Jennifer Williams and Valentine J Burroughs. Section 2 Nutrition through the life-cycle. 4 Growing up healthy: Susan Konek and Diane Barsky. 5 Feeding the mother-to-be: James M Nicholson and Catherine Sullivan and Morghan B Holt. 6 Staying healthy in later life: Connie Watkins Bales and Heidi K White. Section 3 Improving health by changing diet and lifestyle behaviors. 7 Dyslipidemia, hypertension and metabolic syndrome: Frances Burke and Philippe Szapary. 8 Diabetes, pre-diabetes and hypoglycemia: Marion J Franz and Richard Wender. 9 Gastrointestinal disorders: Marianne Aloupis and Thomas Faust. 10 Everything else: Marion Vetter and Katherine Chauncey. Section 4 Vitamins, minerals, supplements and alternative nutrition. 11 Vitamins: Randee Silverman and Jeremy Brauer. 12 Minerals: Randee Silverman and Jeremy Brauer. 13 Dietary and nutritional supplements: Joel S Edman and Elizabeth Horvitz. 14 Considering the alternatives: Benjamin Kligler and Joel S Edman and Mary Beth Augustine. Section 5 Successful changes to the environment. 15 It’s all about changing behaviors: Darwin Deen (Albert Einstein College of Medicine) and Alice Fornari. 16 Community counts: Kathryn M Kolasa. 17 Cultural considerations: Kim M Gans and Charles B Eaton.